What Is DA Form 5913? DA Form 5913, Strength And Feeder Report is a form used for providing field kitchens with the number of personnel present at the training location. This form also indicates the period of time during which the unit will be participating in training. 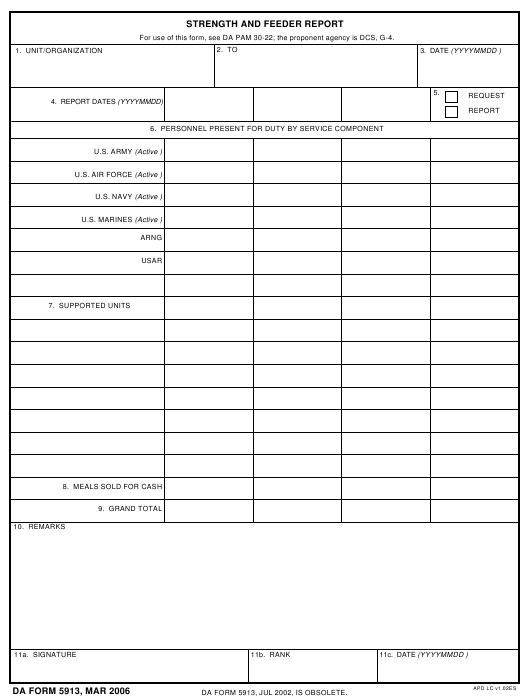 The latest version of the form - sometimes incorrectly referred to as the DD Form 5913 - was released by the Department of the Army (DA) in March 2006. An up-to-date DA Form 5913 fillable version is available for download and digital filing below or can be found on the Army Publishing Directorate website. Units have to prepare their DA 5913 at the beginning of the training period and submit it the form in three copies. The first copy remains at the requesting unit, the second form is for the field kitchen and the third one is forwarded to the supply section. For use of this form, see DA PAM 30-22; the proponent agency is DCS, G-4. DA FORM 5913, JUL 2002, IS OBSOLETE. The top line of the form requires the requesting unit designation, the supporting field kitchen or TISA that will receive the form and the date of completion. Only the first box of the report dates has to be filled in. That should be the first day of training which coincides with the first day of field kitchen support. Box 5 - Request/Report - should be left blank. The next part of the form is a list that requires the total number of personnel present at the training site from each branch of service. That number includes all officers, enlisted soldiers, civilians and personnel hospitalized in medical units. Unused lines should be left blank. If the list of service branches in Box 6 did not cover all categories of personnel present, additional categories can be listed in Box 7. This also applies to cases when the support is consolidated for other organizations. Line 9 - Grand Total - requires the total amount of present personnel listed in Boxes 6 and 7. Any additional information that might be useful for the field kitchen should be listed in Box 10, Remarks. This information should include the number of days of training and the departure date of the personnel.